Asia’s leading music festival returns for the seventh year with some of the biggest Asian artistes of the moment scheduled to perform in Singapore on 21 November 2015. 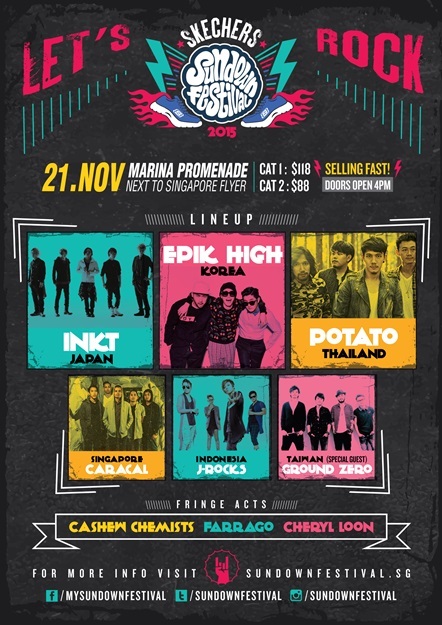 Featuring artistes from around Asia, South Korea’s ‘EPIK HIGH’, Thailand’s ‘Potato’, Japan’s ‘INKT’, Singapore’s ‘Caracal’ and Indonesia’s ‘J-Rocks’ are the initial line-up of headline acts scheduled to rock it out at the Skechers Sundown Festival 2015. Staying true to its mission, of uniting Asia through music as well as creating a platform for local talents to showcase their skills, the Festival will also feature fringe acts comprising up and coming artistes. Homegrown Singaporean musicians ‘Cheryl Loon’, ‘Cashew Chemists’ and ‘Farrago’ are some of the exciting artistes performing this year, with special guests ‘Ground Zero’ from Taiwan! We have a little surprise for you! Kojacon Report has 4 Skechers Sundown Festival tickets category 2 for our readers for free!! Check out how to join this giveaway and terms an condition below!